Researchers were able to reverse Type 2 diabetes without the use of medication. Some people with Type 2 diabetes were able to put the disease in remission without medication by following a rigorous diet plan, according to a study published today in the Lancet medical journal. 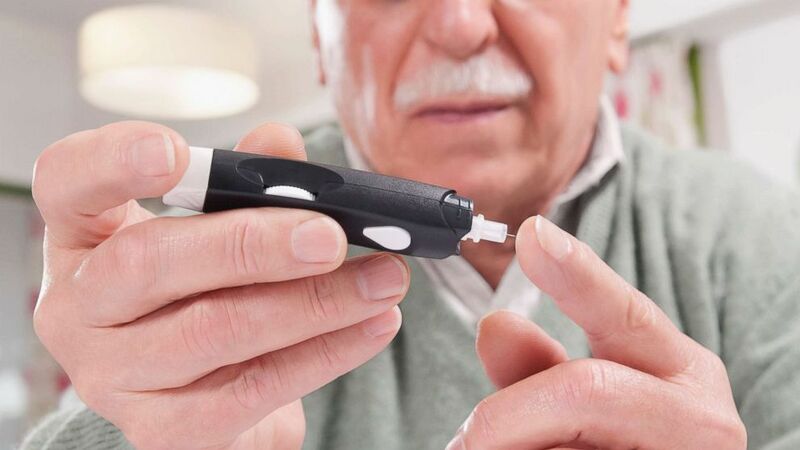 "Our findings suggest that even if you have had Type 2 diabetes for six years, putting the disease into remission is feasible," Michael Lean, a professor from the University of Glasgow in Scotland who co-led the study, said in a statement. The researchers looked at 149 participants who have had Type 2 diabetes for up to six years and monitored them closely as they underwent a liquid diet that provided only 825 to 853 calories per day for three to five months. The participants were then reintroduced to solid food and maintained a structured diet until the end of the yearlong study. (STOCK PHOTO/Glow Wellness via Getty Images) Testing blood sugar level in an undated stock photo. The researchers found that almost half of the participants (68 total) were able to put their diabetes in remission without the use of medication after one year. In addition, those who undertook the study also lost an average of more than 20 pounds. Thirty-two of the 149 participants in the study, however, dropped out of the program. The study comes at a time when more than 100 million American adults are living with diabetes or prediabetes, according to a report released earlier this year by the U.S. Centers for Disease Control and Prevention. Prediabetes was defined by the CDC as a condition that if not treated often leads to Type 2 diabetes within five years. In addition, approximately 90 to 95 percent of the more than 30 million Americans living with diabetes have Type 2 diabetes, according to the CDC. Roy Taylor, a professor at Newcastle University in the U.K. who co-led the study said in a statement announcing the findings that the impact that diet and lifestyle has on diabetes are "rarely discussed." "Rather than addressing the root cause, management guidelines for Type 2 diabetes focus on reducing blood sugar levels through drug treatments. Diet and lifestyle are touched upon but diabetes remission by cutting calories is rarely discussed," Taylor said. He added that the participants were not asked to increase their physical activity at all, but only asked to modify their diet. "A major difference from other studies is that we advised a period of dietary weight loss with no increase in physical activity, but during the long-term follow up increased daily activity is important," Taylor said. Taylor also wrote that the study offered a more universal approach to reversing diabetes compared to undergoing bariatric surgery, which can achieve Type 2 diabetes remission for some people, but "is more expensive and risky, and is only available to a small number of patients."